For this afghan, I combined an assortment of five handspun alpaca yarns, some of which I spun myself and some of which I purchased from other handspinners. Most of the yarn are worsted weight; all are in natural colors. I chose the colors randomly as I knitted two sizes of mitered squares in which one builds on another. This is a great stash project. The mitered garter squares are tolerant of slight gauge differences. After the first square is worked, all the others are worked onto existing squares at a rate of one stitch picked up for every garter ridge. This makes it easy to know where to pick up stitches and further evens out discrepancies between the gauges of different yarns–some squares are simply denser than others. A solid-color garter-stitch edging unifies the piece. The afghan shown used 300 yards (275 m) of Color A, 300 yards (275 m) of Color B, 874 yards (800 m) of Color C, 400 yards (365 m) of Color D, and 200 yards (182 m) of Color E.
The completed afghan weighs 750 grams. 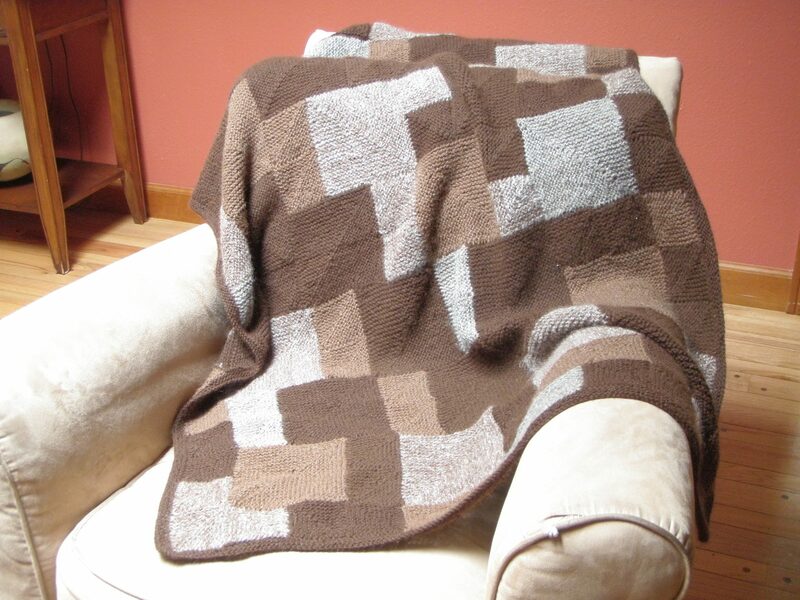 You could easily work more or fewer mitered squares to make a larger or smaller afghan.